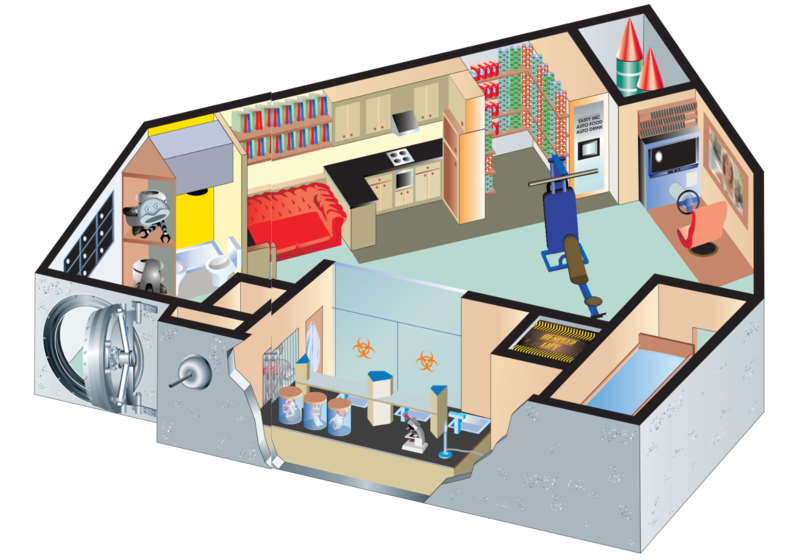 Planning regulations in most countries make building a secret underground laboratory or indeed any kind of ‘lair’ perilously difficult. Here are the key factors you will need to consider. Location is everything. No need to buy in a central location but the geology and foundations must be right. Out-of-town and wilderness sites are ideal but may prove expensive in terms of building costs. Get expert help. Building a research bunker isn’t a do-it-yourself job. There are some off-the-shelf plans available, but you will need a specialist architect and scientific advisor. Hire a building project manager that is ‘on the edge’. They’ll need contacts in the security industry to get the kind of kit you are going to need. They should have experience in developing top-secret projects. Try to keep neighbours and casual observers in the dark. Tell them you are building a large swimming pool or a studio for your new potter’s wheel. Use screens to shield sensitive work from prying eyes. Start a Charity Start an anti-zombie ‘save the world’ charity. Get celebrities involved as they normally love this kind of thing. Christmas single Release a classic Christmas single. Again, remember the celebrities. Crime pays Start a secret life of crime, amassing substantial amounts of cash. look east Make contact with royal families in the Middle East, explain what you’re up to and that you need a large loan. Family ‘investment’ Talk to your family. They may not understand your work, but you can always brand it as an ‘investment’ – technically, that’s not a lie. At some point during your work with the virus, you will need to collect and manage ‘live’ zombie specimens. Working with zombies is always a dangerous activity so ensure that you keep them sealed off where possible. Always fully destroy your test subjects and wear protective clothing when conducting experiments, including safety goggles. Never assume a zombie is dormant. Always approach them with caution.